Classic Land Rover Font 2 Point Static Lap Belt Seat Belt Kit. Land Rover Defender All 1984-2012. Here we have a single lap belt kit for a single seat in you Classic Land Rover. A TWO point Static unit as original with a 120cm webbing length and a 24cm Fixed buckle, fully reversible so can be used for both Left and Right hand sides. 2x 2 point Adjustable belts. Buckle width : 4.4cm. For single or double seat. (2 sets will be needed for double seats). Fits most Chinese go kart, UTV and buggie. Thickness: 0.1cm/0.04"(approx). 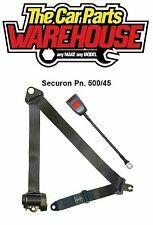 SECURON 500/CV LAP & DIAGIONAL SEAT BELT KIT. Webbing length (retractor to end bracket) 376cm. EVERYTHING YOU NEED IS INCLUDED IN THE KIT SO THEY CAN BE EASILY FITTED TO EXISTING ANCHOR POINTS. THE BUCKLE LENGTH (FEMALE END) OF THIS BELT IS 30CM LONG. EVERYTHING YOU NEED IS INCLUDED IN THE KIT SO THEY CAN BE EASILY FITTED TO EXISTING ANCHOR POINTS. THE BUCKLE LENGTH (FEMALE END) OF THIS BELT IS 15CM LONG. EVERYTHING YOU NEED IS INCLUDED IN THE KIT SO THEY CAN BE EASILY FITTED TO EXISTING ANCHOR POINTS. THE BUCKLE LENGTH (FEMALE END) OF THIS BELT IS 45CM LONG. This rear lap seat belt is a static seat belt, made from strong, durable and effective webbing designed to withstand any impact if in an accident. Static Lap Belt. 2"/47mm wide Static lap belt. Total Length up to 164cm including buckle. This rear lap and diagonal seat belt is a static seat belt, made from strong, durable and effective webbing designed to withstand any impact if in an accident. Static Lap & Diagonal Seatbelt. 2"/47mm wide Static lap & diagonal belt. VAUXHALL PART NUMBER: 13305707, 13250509. GENUINE VAUXHALL PART. This rear lap and diagonal seat belt is a static seat belt, made from strong, durable and effective webbing designed to withstand any impact if in an accident. Static Lap & Diagonal with different length buckles. LAP & DIAGONAL. PART NUMBER 264. EVERYTHING YOU NEED IS INCLUDED IN THE KIT SO THEY CAN BE EASILY FITTED TO EXISTING ANCHOR POINTS. 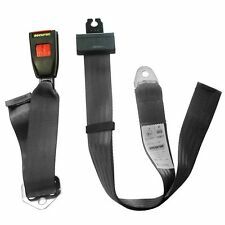 SEAT BELT SECURON 500/30 LAP AND DIAGONAL INERTIA REEL SEAT BELT fits land rover defender. 1 x Automatic (Lap and Diagonal) GSB500/30 SECURON Seat Belt, in black suits both left and right hand side. This seat belt is made from strong, durable and effective webbing designed to withstand any impact if in an accident. JK Part Number: J11956Quality Securon product. Front seat belt kit. Fits T4s from 1992 to 1996. Don’t cut corners on safety. This 3-point, automatic belt, made by Securon in the UK, fits T4 models from 1992 to 1996. This auto rear lap and diagonal seat belt is a static seat belt, made from strong, durable and effective webbing designed to withstand any impact if in an accident. Auto Lap & Diagonal Seat Belt. 2"/47mm wide Retracting Lap & Diagonal belt. Part Number : 735452806. NEW Genuine Fiat Parts from Fiat Main dealer. Fiat 500 Safety Belt Pre-tensioner (Passenger Side Front). This auto rear lap and diagonal seat belt is a static seat belt, made from strong, durable and effective webbing designed to withstand any impact if in an accident. Auto Lap & Diagonal Belt. 2"/47mm wide Retracting Lap & Diagonal belt. MGC's and V8's since 1982. Land Rover part number BTR 9049LNF. Range Rover P38 front left passenger seatbelt buckle. 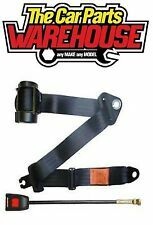 Fits early model P38's without seatbelt pre tensioner, 94-99. JK Part Number: J14699Quality Securon product. Fits either front seat in VW Beetles from 1946 to 1998. Grey webbing, three mounting points. VW Beetle Cabriolet. The No.1 Parts & Accessories Supplier for VW Camper Vans and Beetles. Part number 1j0 857 488 b. Volkswagen Golf mk4 Rear Seat Belt Anchor. A picture is 1000 words. You are buying USED CAR PARTS, THE PARTS ARE NOT NEW. Land Rover part number BTR 9049LNF. Range Rover P38 front left seatbelt buckle. Fits early model P38's without seatbelt pre tensioner, 94-99. 3 Point Auto Car Safety Seat Belt Lap Retractable Adjustable Universal. 1 x Universal 3 Point Retractable Car Seat Belt. This universal seat belt which is suitable for most kinds of cars. Type: 3 Point Car Seat Belt. Securon 210 static seat belt, suitable for lap only rear seats. The buckle is on a 47cm adjustable webbing and the main belt section is 120m from end bracket to end bracket. The buckle is twin release so can be opened with a button on the top or on the side. Fits:-Fiat Doblo Mk1 models made from:- 2000 to 2009 with Part Number:- 603949800. For Sale:-Fiat Doblo Seat Belt Passenger Side Front. Wing Mirror. The rest of the World = £23.65. We're here to help whenever you need us. 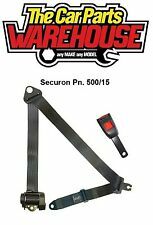 These parts are manufactured in the UK by market leader, Securon. The kits are suppliedNEW and boxed and have the Part No.500/15. TRIUMPH GT6 MkI, II & III ; YEARS 1966-1973. TRIUMPH DOLOMITE 1300, 1500HL, 1850, 1850HL & SPRINT ; YEARS 1972-1980. 1995-1999 E36 3-Series & M3. - 1999-2006 E46 3-Series & M3. They are manufactured from 4mm hi-strength steel and are powder coated black. These locate between universal seat runners and the seat mount making their application totally universal. Removed from 3 Series E90 320D PRE LCI 2006. Part number: 6035802D5C. Shelf location: 1A24. Wing Mirror Type. Screws, nuts and bolts are also classed as a free gift if included. All parts are used but fully tested and in full working order before removal. They are manufactured from 4mm hi-strength steel and are powder coated black. These locate between universal seat runners and the seat mount making their application totally universal. This listing is for a used part This Middle/Centre Seat Belts is from a 1998 Discovery 1 300TDI Please match current part number of BTR7770LNF as shown in photo Good used condition, Some flaking on brackets. As shown in photo. 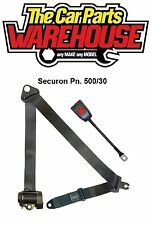 Securon 300/30 static seat belt, suitable for lap and diagonal front seats. The buckle is on a 30cm stalk and the main belt section is 217cm from end bracket to end bracket. The buckle is twin release so can be opened with a button on the top or on the side. This rear lap seat belt is a static seat belt, made from strong, durable and effective webbing designed to withstand any impact if in an accident. Seat Belt Static Lap Red 210RED Securon. Part Number 210RED.